CivilizationGreek, 525 B.C.E. - 500 B.C.E. Over the past few centuries, Greek architecture has influenced countless civilizations in a search to connect to the classic ideals of form and aesthetics. This fragment of a Greek terracotta roof frieze shows how the Greeks themselves were influenced by previous civilizations, notably the Egyptians, as they adorned their buildings with these intricate and highly stylized carvings. 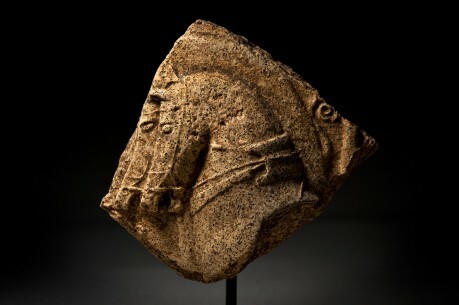 This fragment shows two horses harnessed with a hint of a chariot or some other vehicle just outside the existing frame. The horse in the foreground has a well-coiffed mane that looks as though it has been manicured for prominent display. The heads of these horses are titled downward towards their necks as though they are fighting against the reins, yet their eyes are focused forward in a resolve to continue their journey. The artisan who carved this scene took pains to render the fine ropes of the harness, and even the slight curves of the foreground horse’s upper shoulder speak to an understanding of depth and perception.